Composer Seth Bedford enjoys wandering the West Village in search of coffee and is passionately committed to daydreaming. He is entirely too enthusiastic about Mid-Century Modern design and architecture, 1930s Weimar Kabarett, 1960s French Pop, attempting to paint, and pretending to learn new languages. When he is not doing those things, he composes silly music and teaches children and to do the same. His formal music education began in a West Texas public elementary school, where he eventually began studying the cello. Since those days, he’s added piano, viola and percussion to his list of instruments taking up space in his apartment. And, though a miserable and easily distracted student himself, he earned his Bachelor’s degree in music composition from the University of Texas at Austin where he studied with Dan Welcher and Kevin Puts. Since then, he’s been dedicated to connecting schools and communities to composers and new music. 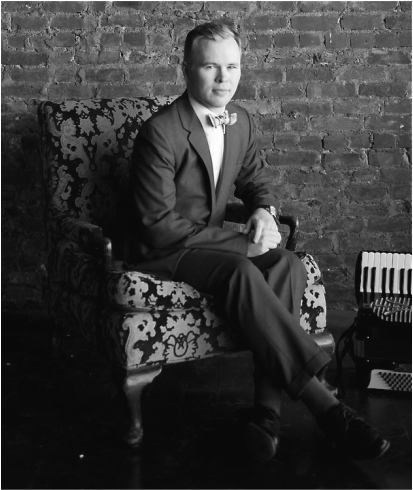 He’s inspired by a variety of sources, but most particularly composers like Scott Joplin, Kurt Weill, and Tom Waits. And, he’s been fortunate enough to work with some outstanding artists and ensembles like clarinetist Angela Shankar, vaudevillians Brent Weldon Reno and Kim Smith, Belgian chanteuse Micheline van Houtem, and the Queer Urban Orchestra and The Chelsea Symphony to name a few. Most recently, he’s composed a piece commemorating the 50th anniversary of the 1964/65 World’s Fair for The Chelsea Symphony and saxophonist Aaron Patterson as well as music for the Peculiar Work Project’s “Floydada,” a play by Barry Rowell about two sisters who open their own Dada cafe in their small West Texas town in the 1920s. He’s particularly thrilled to take on his latest collaboration with pianist James Adler, Grand Concourse for Piano and Orchestra. The piece is essentially a collection of preludes for piano and orchestra each inspired by one of four locations on the street in the South Bronx after which it is named. Some of New York’s most significant (and overlooked) architecture exists on the Concourse. The “Grand Boulevard and Concourse,” as it is officially known, was designed in the late 19th Century and modeled after Paris’ Champs Elysee--excepting that the Concourse is twice the length of its inspiration. The piece intends to take the listener a sort of “audio tour” of a small area of the street and a few of its striking structures.